The human brain has two writing modes, creating and editing. It cannot switch back and forth between the two efficiently or easily. Because of this, I always advise writers—especially new writers—to stick to one mode or the other. The very first thing to do is to get a draft on paper, even if it is terrible. Then, the writer should go back to any areas he knows to be awkward or to phrases that he could not get right on the first try and attempt to smooth over them. At this point, it is always best to have a pair of fresh eyes take a look at the draft. This is where the copy editor comes in. Some writers labor under the misapprehension that copy editors are only good for the final grammar and spelling check. This is not the case at all! Most word processing software will run a basic spell check, and most can find the common grammatical errors as well. Copy editors do much more than that. As a copy editor, the first thing that I do when I get a new article or essay is to read over the entire thing and look for glaring mistakes in context or inconsistencies in the layout. I will also make sure that the progression of the topic makes sense and flows along an outline from beginning to end. Anything that I miss in this editing stage gets caught in stage three. The second read is for grammatical, spelling, and obvious syntax errors. Some editors will leave this for last, but I usually cannot stand leaving them longer than this. The mistakes that I most commonly find in this edit are homonym issues (e.g. they’re, there, their), verb conjugation—especially using past tense instead of subjunctive tense, and minor spelling errors, which usually occur because the author was writing in a hurry. The next read through is to make sure that the overall story that the writer is conveying makes sense. This is also the time that I take to cross out unnecessary details that obscure the author’s intention, and sometimes combine or separate sentences to flow more easily. Depending on how well I know the writer’s style, I may also make suggestions for clarifying phrases or sentences. Of course, while doing this, I have to be careful to not step on the author’s toes. I always leave the original wording in the draft, with the strikethrough sign, and type my suggestions in a comment or another color font to make it clear that they are not a part of the original draft. At this point in the editing process, I will return the draft with the first round of edits to the writer. He or she can choose to take my suggestions, or may ask me why I have suggested certain clarifications. Once his changes have been made, the writer sends me a second draft. At this point, it is much like receiving a brand new manuscript, so I read through it three times in the order that I did the first time. A lot of time and care goes into making sure that the author not only gets across his intended point, but also that he does it in a way that does not undermine his credibility, such as using vocabulary incorrectly, or having glaring grammar errors. The draft goes back to the writer, and is checked over. By the second draft, most edits are very minor, and are usually accepted. I always insist on reading the final draft one more time before publishing, just to make sure everything is exactly right, and I have not missed a comma, or the double space after a period. Then the “publish” button is hit, and the post is live! Copy editing is time intensive and takes a lot of effort. One of my favorite quotes is sometimes attributed to Justice Louis D. Brandeis, “There is no great writing, only great rewriting.” This is true. Behind every great author is a great copy editor. You can find more interesting information about copy editing, and an interview with an editor here. 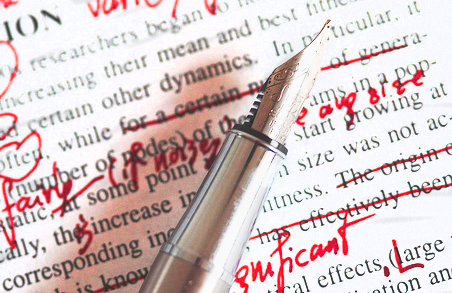 As an editor, one of the scariest things I have to do is… edit someone else’s work. It may sound odd, because it is my job, but it is the truth. As an editor, I’m responsible for taking the brain child of another human being, and making just enough changes so that readers can understand it, while making sure the author’s voice is never lost. A large part of the fear comes from the fact that telling another person that their work needs improvement is never easy for either party. It is important that I as an editor point out the flaws in writing as gently as possible. At the same time, it is always hard for anyone to accept criticism without taking it too personally. First of all, it is important that an editor and a writer have a good working relationship. It is a bonus if they have a solid friendship. Often when two stubborn people bump heads over the correct word to use in a sentence—and believe me, both writers and editors are inherently stubborn; it’s in their genetics—only a healthy relationship will allow them to back away from the situation. This relationship also allows them to see each other as humans, and not just the faceless creator or modifier of words on a page. Often, this relationship (and sometimes a significant distance between them) is all that will keep an editor from killing her blog writer. Not that I speak from personal experience, of course. Secondly, as an editor, it is important to have respect for the person whose work is being edited. I have found that when I personally respect the person whose writing I am editing, I am much more likely to be cautious in how I approach changes. I never tell a writer that their ideas are stupid. As far as I am concerned, every idea is excellent—it is sometimes merely a diamond in the rough. It may require a little cut and polish to truly shine. Instead I find ways to point out how their ideas can be improved, or that their particular audience may not be the most appreciative of a piece of writing. I keep my words respectful as well. Sometimes just the choice of language in discussing someone’s work is the difference between making them angry, and actually getting a fantastic final piece of writing. Lastly, and I have mentioned this before, it is incredibly important to retain the author’s voice in his piece. If I think that a sentence or paragraph is awkward or unclear, I usually will just say as much to the author, and allow him or her to rewrite it in the way that seems best. If they prefer that I give them suggestions, then I do so, but in a style as close to theirs as I can write. This is much easier if I do have a good working relationship or a friendship with the person. Being a good editor comes down to the attitude with which I handle the person writing the piece. To make sure that I don’t piss off the writer, I try to establish a good relationship with him, hold him and his work in regard, and I do my best to preserve his voice within his work. Have you ever worked with someone that you pissed off too badly to continue working together? Let us know in the comments.